If you can't get over your love of Santana, there's the Hard Rock Cafe. If you want to know what it'd be like to shake hands with Vincent Price, there's Planet Hollywood. If you wanted to eat a burger in sight of a plaster tree frog, there's Rainforest Cafe. Now, if you love TV shows about grumpy grandmas there's finally a place you can call home. Rue La Rue Café in the Washington Heights neighborhood of Manhattan will be the Golden Girls-themed cafe of your nostalgic dreams. The owner, Michael J. LaRue, was close friends with the late Rue McClanahan (eh? Rue La Rue?) and plans on decorating the place in memorabilia from McClanahan's estate. The ribbon cutting ceremony will even have an appearance from Betty White, the lone surviving cast member of the show, according to LaRue. It won't just be the decor, the menu will have foodstuffs — "cheesecake, soups, wraps, salads, desserts, baked treats and wine" — named after the characters and episode. Hopefully there's a Sophia sauce of some kind. "When she died, I inherited all her personal belongings and show business memorabilia," LaRue told DNA Info. He was the executor of her estate and the administrator of her will. He's joined in the business by Mark Bisch, son of McClanahan. Because of that partnership the Walt Disney Company is reportedly going to let the cafe make its own Golden Girls merchandise. They will be the only location in the world with that permission. 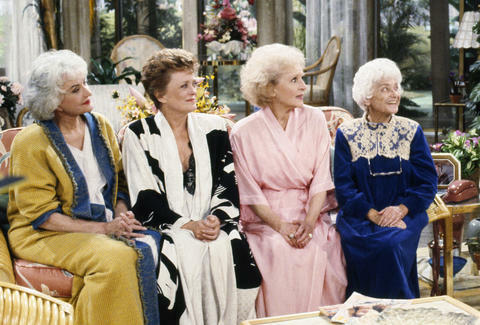 The show ran for seven seasons with McClanahan as the feisty Blance Devereaux, White as the hapless Rose Nyland, Bea Arthur as dry Dorothy Zbornak, and Estelle Getty as crotchety Sophia Petrillo. They were the only four actors to appear in all 177 episodes of the show. There's isn't a date set for the cafe to open, but to be safe, it's probably best to steam your finest satin robe now. Dustin Nelson is a News Writer with Thrillist. He's such a Sophia. Follow him @dlukenelson.